Our QSN Chapter at Pomona College is a large community working to create more safe spaces for low-income, first-generation students by providing a support network and creating more campus-wide dialogue about issues of class. We are officially recognized and funded as an on-campus organization by Pomona and we have developed important relationships with a network of faculty, administrators and staff who truly care about ensuring our chapter continues to grow and thrive. Co-hosting events has helped us to get to know staff in offices such as the Career Development Office and the Office of Study Abroad, and we are continuing to work to ensure these offices provide services to help QuestBridge Scholars thrive at Pomona and beyond college. 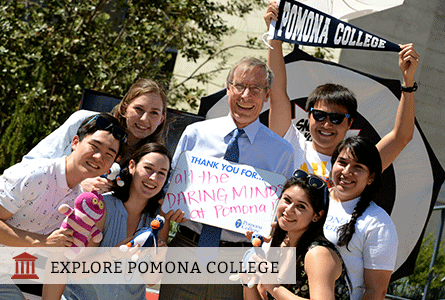 Our chapter has a great relationship with our admissions office, and we help to host visiting students during Fall Weekend programs when Pomona helps underrepresented prospective students visit our campus. After College Match decisions come out each year, we call all the students matched to Pomona to welcome them to our Sagehen family (the Sagehen is our mascot!) and answer any questions they or their parents have. Because Quest has existed at Pomona for 10 years, we are beginning to create our own alumni network and host events with Quest alums to talk about life beyond college and the experience of low-income, first-generation Pomona grads at medical and graduate schools. One of the strongest parts of our Quest chapter is our mentoring program. Each new Quest student fills out a mentor program application and is placed in a group of about 10 first-years with two student mentors and a faculty advisor. These groups meet for meals and frozen yogurt to build friendships, discuss our Pomona experiences and host events like writing workshops with faculty. Throughout the year, our Events Committee works to put on many fun and meaningful events including a weekend bonding retreat to Pomona’s cabin in the mountains, a day when we “Explore LA,” collaborative workshops with student organizations like the Mental Health Alliance and several mixers with faculty and staff. We are a very active chapter that provides great opportunities to make friends among both students and faculty, and we are always working to help our chapter grow and improve. We hope that you will reach out to some of Pomona’s QuestBridge Scholars if you have any questions. We look forward to helping you get to know our school better and hope you will join our community soon!